Joe’s struggling to package a truckload of parts before noon. Mary can’t keep up on the painting line. Jimmy’s in trouble with the boss because he can’t make quota. These are just a few of the challenges faced by workers on the manufacturing floor, problems that, in many cases, can be solved with collaborative robots. More affectionately known as “cobots,” collaborative robots are opening new possibilities in manufacturing. In this brave new world, cobots and humans work side by side in a common space not segregated by fences or walls. Need to hand deburr a few hundred parts, or insert bushings into thousands of assemblies? Grab a cobot, show it what to do and go back to whatever intelligent task you were doing. Cobots are perfectly happy getting stuck with the short end of the manufacturing stick and won’t complain about doing the dirty, dull and dangerous tasks we humans grumble about. But what are cobots, and how are they different from the robotic arms that load material in CNC machine tools and weld car chassis? The complete, mind-numbing details are available in the robotics safety specification ANSI/RIA R15.06-2012, jointly published by the American National Standards Institute and the Robotic Industries Association. Briefly put, the spec describes collaborative operations as ones where the robot monitors its surroundings and slows down or stops in the presence of a human, where force and power are limited in a work space shared by humans and robots, or where the robot is manually guided by a human. 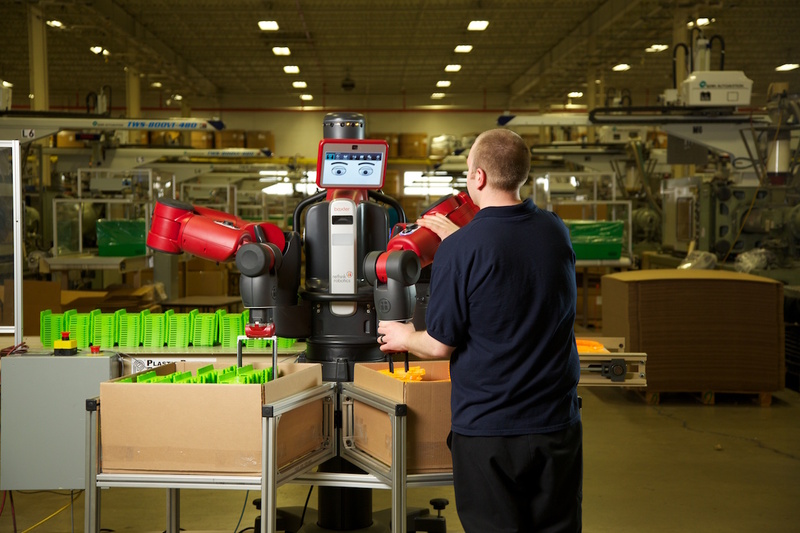 Bob Doyle, director of communications for RIA, pointed out several additional differentiators between cobots and their stronger, faster and more accurate counterparts. The first is safety. Interfere with an assembly line drone as it bolts wheels onto an F-150 and you might be headed to the emergency room. Granted, safety barriers make this an unlikely situation, but unless using sharp or very heavy objects are part of its duties, injury such as this could never happen around a collaborative robot. This entry was posted in Machining and tagged cobots, cutting tool engineering, robots. Bookmark the permalink.